The Missouri River is the longest river in North America and the 15th longest in the world with a length of 2,341 miles. The drainage area of the river covers total 1,371,000 square kilometers. It flows through many states including North Dakota, South Dakota, Iowa, Nebraska, Missouri, Kansas and Montana. The river rises in the Rocky Mountains of Western Montana. 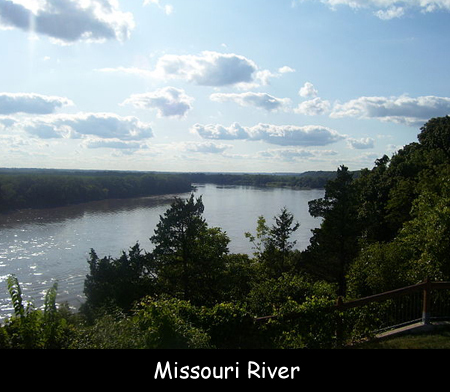 The Frenchmen Father Jacques Marquette and Louis Joliet became the first Europeans to come across Missouri River in 1673. Missouri River when combined with the lower Mississippi River forms the world’s fourth longest river system. The name ‘Missouri’has been derived from the Missouri tribe name which means ‘people with wooden canoes’. This river’s basin is home to a wide variety of animal and plant life. It is estimated to have formed about thirty million years ago. Major tributaries of this river include Yellowstone River, Platte River, and Kansas River. By discharge, it is the ninth largest river in the entire United States. The minimum flow beings at 4,200 cubic feet per second and the maximum 900,000 cubic feet per second. The major dams built on the river were Fort Peck, Garrison, and Gavin’s Point and Fort Randall. Lewis and Clark became the first Europeans to travel the entire length of the river in 1804. In some places, the river has relocated more than 2,000 feet of soil with its flow. Declan, Tobin. " Missouri River Facts for Kids ." Easy Science for Kids, Apr 2019. Web. 26 Apr 2019. < https://easyscienceforkids.com/missouri-river/ >.